About a month ago, I took a marvelous hike in Mentryville with Spoondoggie and OLdweeb. Mentryville is an old oil drilling community from the late 1800s which is long since a ghost town. Its history can be found on Wikipedia , and one of the caches takes you to the plaque commemorating “Pico #4”, the first commercially successful oil well in California. The first leg of our hike took us back in to the canyon and to the old wells and drilling equipment. I’ve been out here before for caches and the hike, but knowing the significance of the history of the area always gives me a sense of connection with my home state when I’m out here. About a week later, I visited the Getty Museum with my sister where one of the exhibits we saw was an extensive collection of the first photographs of California, taken in the late 1800s. One of them was of the Pico #4 – fully functional and surrounded by workers! After having seen the site for myself, the photo brought all of the history to life for me. It had rained recently, so I got to carry half the trail down on my shoes. Yes, it’s time to get my car detailed again. The first time I hired the guy I use regularly now, he checked out the copious dirt and mud in my car and asked me if I were in construction. I love having evidence of adventure in my floor mats. Until next week… cache on! January is probably my favorite month to be here. It starts with the Rose Parade on the 1st, which almost invariably has perfect weather that much of the rest of the country gets to watch on TV between bouts of shoveling snow or braving subzero temperatures to go to the store. My sister came down to visit this year, and we got tickets in the bleachers to see the parade. It’s something to be experienced at least once, as it’s one of the most spectacular events of its type anywhere. Only in person can you get a sense of how large the floats are and how truly ornate the decorating is. The marching bands are big, too, some stretching for over a city block. The horses and Western roping, the celebrity grand marshall, the general feeling of celebratory renewal of the new year, the opportunity to eat bacon-wrapped hot dogs (we were SORELY tempted, but passed on those!) are all best seen/felt/smelled while sitting right there. We got bags of free snacks from a local grocery chain: Stater Brothers. We saw an overly fatigued tuba player in the USC band sideline himself and have to wait for a rescue van. We marveled at the motorcycle cops showing off their synchronized driving skills. Yes, we found a geocache, too! It was at the Burger KIng across the street from our bleachers, even! I got to watch it a couple of years ago flying around the Lancaster area as I was geocaching out there one day. It never fails to leave me stunned, impressed, and moved by its beauty and power. a bucket of “snow” in a cache at Desert Hot Springs!! You’ve got to be kidding, this is the desert! Does anyone know what this stuff is?? It felt cool to the touch, was not sticky, but felt like it would make a nice snowball! It was way too funny to find this in the warm, dry desert. You can always count on the Wheeler Dealers for surprising and entertaining hides. January is also a great month for working on that tan! I did find cache #18,000 this week, too! f0t0m0m and I made a 63-cache run in Palm Springs and this Wheeler Dealer hide was the milestone! The container was even a little gecko. I liked choosing this one, as I found my first 10,000 or so caches using a Garmin Geko – actually two of them – and I wore them both out! A fourth of my ancestors are from Sweden, and my name is entirely Swedish, being named after my great-grandmother on my dad’s side. I know I have distant cousins up in Linköpping, but looking them up will have to wait for the next trip. He makes it sound so purty…. There’s a cache under the stairs! Found it with my iPhone, as we did all of them… that’s all I brought with me. It was a little squirrelly, but it worked. Next time, I’ll bring my the Garmin Map60CSX,though. Alas, my stay was just over a week. It was enough time to see everyone and enjoy being there, though, and to whet my appetites – both figurative and literal – to return. On the way back, I did get to ride the spiffy German trains and have a white Christmas during my layover in Portland. Next week, I’ll be posting about “winter” caching in Southern California, where it’s still a good time to be working on my tan. Until then – cache on! Podcacher.com posted this, a very cute take on the Bangles’ song! When I learned that Vels in Denmark had hidden a cache for each of the top ten cachers, I knew I had to go find it, since I’d be staying so close in Northern Germany. Fortunately, my exchange sister, Gerlinde, has a penchant for adventure equivalent to mine, so off we went, following the maps in my iPhone, to find caches in the next country over. OK, all you other Top Ten cachers… get yourselves to DK and find your caches! After that, we went with them to a large sculpture garden with the art of Rudolph Tegner (1873-1950). I thought his work showed more realism than would be expected, considering his influences, but we only saw the outdoor part. and a link to the museum, which is out in a rural part of northern Denmark. We found two caches, one which Vels had DNFd before and walked right up to that day! The weather was brisk and windy, but the views were marvelous and sweeping, so the experience was exhilarating. Our trek to the next country over took us along the northern coast of Denmark. I’ve googled “what is sea foam?” and it would seem to be a mysterious substance. Anyone know about it? We drove by Hamlet’s castle! Is something rotten in Denmark? Ah… so many quotes, so little blog space…. Next week – our third country in one day: Sweden! Geocaching Journal put me at the top of that list! Chapter 5 of my Twitter novel starts tomorrow morning – please consider following me AND the other nine fun twitter-cachers! Meanwhile, here’s a photo of where I was yesterday with RobbDogg, Albackore, Andy of Team Perks, and Capdude. We all found over 100 caches, most of them placed by f0t0m0m – more on that adventure soon…. Welcome to 2009, and a new year of geoblogs, geopix, and geoadventures! Back in 1977, I was an AFS exchange student in Northern Germany, and I decided to revisit the family again this year for Christmas. I’ve stayed in touch, especially when I lived and worked in Germany about 15 years ago. Of course, this trip presented an opportunity to find my first caches in Europe, and I even got to three different countries! 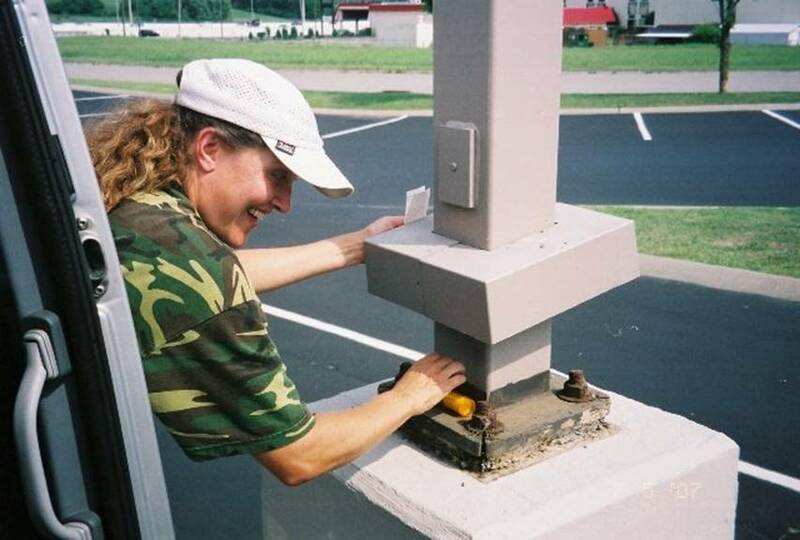 She’s since become a geocacher herself, and went and bought a Nüvi for it! New building in Frankfurt – funky hole in it! Is it art? The town’s manger scene had real sheep! On Christmas Eve, we went to the North Pole. It’s only a few miles from where I visted – who knew? Next stop…. Denmark! … and the cache placed just for me!